The scene: your girlfriend and/or boyfriend (hey, nothing wrong with polyamory) got you tickets to The Houston Livestock Show and Rodeo. You've been waiting your whole life to see those goats up close, so naturally, you want to post pictures of your beloved gift on Facebook, rubbing it in all your friends' rodeo-less faces. Here's a tip: don't. Because someone will steal it. The problem, technically, as illustrated by a Houston local news affiliate below, is with the the barcodes. 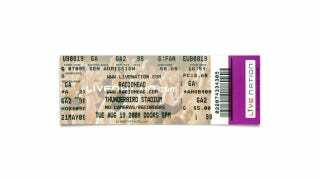 Would-be thieves can use the pictures you post to copy your legally acquired ticket and slap the same barcode on their own, homemade versions. They can even use them to make multiple fakes, selling them to unsuspecting rodeo (or music) enthusiasts by the dozens. Now you're just hurting everyone.